The 2015 Heart and Soul of Georgia tour shows off thriving downtowns in Woodstock, Rome and Dahlonega. On a warm, sunny day, people pour off a bus in downtown Woodstock. Conversations continue as they walk up the sidewalk to the Chambers at City Center, a beautifully renovated 1913 church sanctuary that’s now used as meeting and event space. This is the first stop on the Georgia Municipal Association’s (GMA) Heart and Soul of Georgia tour, a two-day mobile workshop that provides city leaders from across the state the opportunity to see the best of downtown development, learn how goals have been set, accomplished – and paid for – and get continuing education credits from the GMA while they’re at it. It’s just one of a “wide range of things that [the GMA does] to try to help cities either save some money or generate some revenue or just be more efficient,” Bill Thornton, GMA’s deputy executive director, says of the tour. 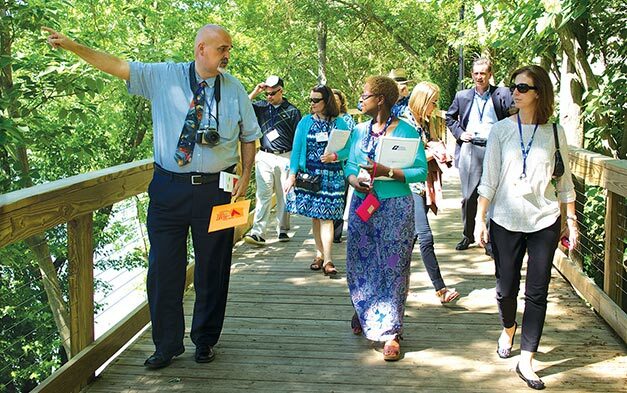 Some 55 people, including mayors, city council members, downtown and economic development folks and more, participated in this year’s tour that included Woodstock, Rome and Dahlonega, three very different cities that are successfully developing their downtowns in very different ways. In addition to networking and talking with leaders of the three cities, tour participants learned from the resource team the GMA brings, experts from a variety of organizations, including the Georgia Cities Foundation and The Georgia Trust for Historic Preservation. The cities may be different, but, in fact, they have two very important things in common: Leaders have learned that for successful downtown development you play to your strengths and you work together. Woodstock’s strengths include a growing population – the area is part of the exploding North Metro Atlanta region – a downtown with available land and city leaders with a vision that became a comprehensive master plan to guide development through 2030. With a railroad track that runs parallel to and within spitting distance of historic Main Street, Woodstock for years seemed to have a barrier to expanding its downtown. But the number of trains has dropped to just two or three a day, says Brian Stockton, director of economic and downtown development for the city. And the time was right to develop the land across the tracks. The mixed-use development includes some 300 residential units that deliver shoppers and diners to new retail and restaurants, as well as to the shops in the historic district just across the tracks via a new pedestrian crossing. To ensure the historic shops look as welcoming as the new development, the Downtown Development Authority provided façade grants so that owners could spruce up storefronts. Now, no matter which side of the tracks you’re on, the opportunities are plentiful. The downtown renaissance didn’t stop with the historic district. Just west of Main Street, Walton Communities worked with the city on a multi-family development that has aided the success of the commercial district and met the city’s goals of providing additional public parking. Woodstock West by Walton, with its wide, tree-lined streets, is now 90 percent occupied, with everyone from millennials to empty nesters, says Amanda Queen, property manager at Woodstock West. Greenspace is also an integral part of Woodstock’s master plan. Residents and visitors can take advantage of walking trails that connect downtown to Highway 92, just south of town, and the city’s dog park and will ultimately connect to Towne Lake and Kennesaw, with 60 miles of trails in the master plan. The trail also runs past Elm Street Cultural Arts Village, 4.5 acres that includes an outdoor stage that draws residents and visitors to plays and musical events, which in turn support the nearby shops and restaurants. Woodstock also showed off the nearly complete renovation of a century-old elementary school into a 21st-century campus of Chattahoochee Technical College, which was scheduled to reopen this summer. Next stop on the tour was Georgia’s Rome, which has decades of downtown revitalization under its belt, thanks to leaders including Ann Arnold, Rome’s director of downtown development. Kay Pippin, the mayor of Jackson and a tour participant, echoes Hiott’s views on the importance of good leadership. “The No. 1 thing I learn [on tours like this] is that wherever you are, and regardless of your resources, the key to success is leadership,” Pippin says. Rome established a local historic district designation along Broad Street in the 1970s and has been revitalizing its downtown, at the confluence of three rivers, ever since. In 2003, the city was named a Great American Main Street, one of only three Georgia cities to receive this designation. But leaders aren’t resting on their laurels. “Jokingly, Rome wasn’t built in a day. This is a long process,” says Arnold about the city’s ongoing downtown development and redevelopment. The walking tour included a look at Forrest Place, an award-winning mixed-use facility that started life as a hotel in 1915 and is now home to both apartments and commercial space, with no vacancies. Tour participants spent the night in the Hawthorn Suites, a renovated 1890s warehouse on the banks of the Oostanaula River, with original wood floors, brick walls and rooms filled with old-world charm. The hotel complex was completed in 2005 at a cost of $4.1 million, with part of the funding coming from the city of Rome and the Downtown Development Authority in the form of low-interest loans from the Georgia Cities Foundation and the Georgia Department of Community Affairs. Leaders in Dahlonega, in north-central Georgia, highlighted master planning and making the most of key assets – whatever a city’s assets are – as the secrets to downtown success. To keep those wedding parties fed and entertained – and to help work off the wine tastings – the easily walkable downtown boasts 17 restaurants and 67 shops. The Gold Museum – Dahlonega was the site of a major U.S. gold rush in the late 1820s – housed in the restored 1836 courthouse in the center of the downtown square is surrounded by one of the largest collections of historic wooden buildings in the Southeast, many boasting inviting second-floor porches. Dahlonega hasn’t put all of its eggs in the tourism basket, however. A second key asset is the University of North Georgia right in downtown, which gives the city a built-in, year-round market. “From the beginning,” says Cordle. “when [students] come here looking as a high school junior or senior on a trip to explore college opportunities, we start trying to reach out to those family members and cultivate them as customers for four years, five years, however long the student is here on campus. We also cultivate alumni. And we cultivate the faculty, staff and administrative market. All in all, this year's tour was a jam-packed learning session that moved quickly from asset to asset and left participants excited, exhausted and filled with proven ideas to adapt for their own downtowns.